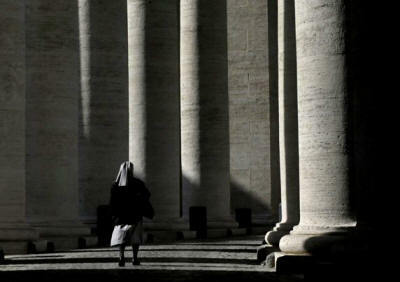 A nun walks under the Bernini colonnade in St. Peter's Square at the Vatican, Friday, Feb. 15, 2013.
approving a German lawyer and financier to head the Vatican's embattled bank. The day after Benedict’s triumphant return from a historic visit to Britain in September 2010, he was greeted with unwelcome news at the Vatican. Italian authorities had seized nearly $30 million worth of Vatican Bank funds that the Holy See was seeking to transfer out of Italy’s Credito Artigiano bank. With $8.3 billion in assets, 33,000 accounts and a distribution network in more than 100 countries, the Vatican Bank often moved funds from one destination to another. Yet officials familiar with the case said they were struck by the size of the transaction and demanded to know where the money had come from. But the Vatican wasn’t telling. Financial scandal at the Vatican was nothing new. In the 1980s, Banco Ambrosiano, a financial institution largely owned by the Vatican Bank, became embroiled in a money-laundering scandal related to the Sicilian mafia. In June 1982, Ambrosiano’s former chairman, Roberto Calvi - dubbed “God’s banker” by the Italian media - was found hanging from London’s Blackfriars Bridge in a death that was ruled a homicide and has yet to be solved. There have been more recent cases of alleged criminality related to the Vatican Bank, including that of Palumbo, who is awaiting trial and has denied charges of using the institution’s secrecy to veil a money-laundering ring. But more frequent have been what Italian prosecutors describe as a haughty resistance to European Union laws forcing banks to prove the legitimacy of funds. Letters of inquiry, prosecutors said, have often been sent to the sovereign city-state only to go unanswered or be tersely rejected. In the case of the $30 million, for example, Italian government officials say they have spent almost three years seeking evidence that the funds are legal. “It's a matter of fact that the collaboration between the anti-money-laundering authorities of Italy and Vatican City have been interrupted, and requests for information have not received useful answers,” Rome Deputy Prosecutor Nello Rossi said. In December 2010, however, Benedict took a landmark step toward transparency, issuing a motu proprio, or papal letter, forbidding money laundering and the financing of terrorism. More importantly, for the first time, he established an independent Vatican watchdog, the Financial Intelligence Authority. Yet subsequent events seemed to undermine his mission. Tedeschi, the Italian economist appointed president of the Vatican Bank in 2009 and who claimed to be an anti-corruption crusader, was fired in May by the bank’s board because of negligence. The banker also became the target of Naples prosecutors investigating money laundering, allegations Tedeschi has denied. Last June, an explosive dossier from his time at the bank was seized by Italian authorities and leaked to the news media. Referring to the 2010 seizure of the $30 million, he wrote that he had been in favor of releasing data to Italian authorities but had been blocked by powerful forces within the bank. Last year, in a cache of documents leaked by the pope’s butler, fresh details emerged of the broader quest to clean up administrative corruption within the Vatican. The incident showed how difficult it has been for the Holy See to maintain its traditional airtight secrecy in an age of voracious media, digital or otherwise. Yet even as scandal swirled, the Vatican has also appeared to take genuine strides toward transparency. In September, it hired Rene Brulhart - a wunderkind Swiss lawyer who helped clean up the dodgy reputation of Liechtenstein’s banking system - as a special adviser, quickly promoting him to the head of the Financial Information Authority. Under his direction, the agency is thought to be formulating a series of major directives aimed at pushing the city-state toward a deeper embrace of international banking norms, with announcements expected in the coming weeks. However, the committee said, the bank lags in monitoring suspicious activities and carrying out sufficient due diligence. “We have informed everybody very well of the path that we are following to be a part of the international system of controls on money laundering, and we have been doing so for two full years,” said the Rev. Federico Lombardi, the Vatican’s spokesman.